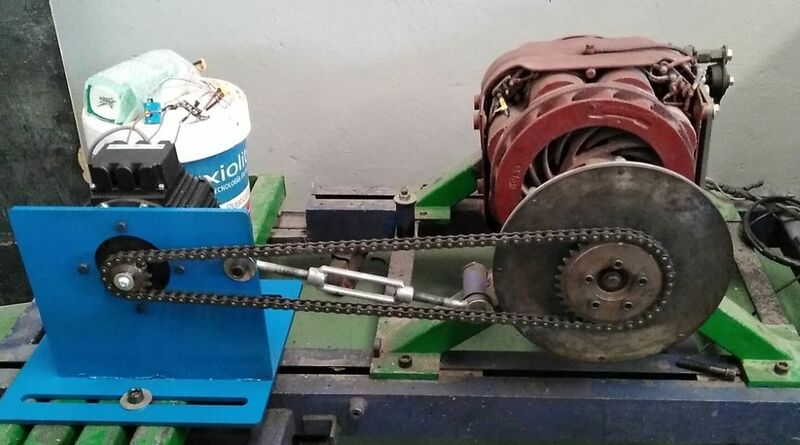 The purpose of a standard dynamometer is normally measuring HP and TQ, but with electric motors I think the next interesting variable is efficiency. For that purpose in some tests I acquired battery voltage and current (Curtis+Motor is considered a black box) and then with the battery power (V*I) and mechanical power (KW) it is easy to calculate efficiency. This induction motor had a peak of about 86%, but I didn't finish the software for creating a whole map, so I cannot be sure if there is another peak somewhere- Anyway 86% is good for me. And also, keep in mind that when driving the motor to max torque it can decrease up to 65% or so. And regarding the question about torque, normally with electric motors there is a direct relationship between current and torque. But with induction motors it also changes with slip (difference between mech speed and electric speed), so you will need some dyno if you want to have the resulting torque. How much Amps can your inverter handle? Thanks for that elaborated explanation. Well, the Inverter which I made handles upto 300A (I am using a 24V Battery), however I can increase its current capacity handling by changing the MOSFETs that are in the inverter. Till now, I thought 300A will be good enough to run the motor for my application (for the nature of the load I am using). I am using V/f control method to vary the speed of the motor. I have the freedom of varying frequency with the set up I have. I am trying to run the motor at different frequency values, with the motor loaded with a blower fan. At 200Hz, Stator speed is 3000RPM and Rotor speed is 2700RPM (measured), which amounts to a slip of 0.1. If I increase the frequency further the rotor falls out of synchronism since the battery voltage is only 24V and V/f ratio is not maintained further. The problem with me is... like I said in the previous post, I cannot able to track the torque and speed characteristics continuously. I have "Fluke 433 Three-phase Power Quality Analyzer", but I think this wont give torque value. It displays Power output in KW and from that I can calculate torque by using one of the formula. The stuff which you spoke in the post regarding dynamo meters is new to me. I need to get familiarize with using dynamo meters. Since now you know what I am looking for, can you recommend a basic (easy to use) dynamo meter which outputs the continuous torque speed values when the motor is loaded externally? I am testing the motor by loading it with a blower fan (2nd order). V/F is not a good method for traction because it cannot change the voltage fast enough to adapt itself to the changes on load. If you need to climb an incline it will quickly reach to some "short-circuit" as voltage will be too high for current speed. The preferred control method is vector because voltage can change very fast to keep current constant. for measuring torque you need a dynamometer, but as soon as you put some load on the motor the V/F method will reach an overcurrent condition. e-vektor wrote: Yes, during the first tests with the star topology I got 15HP at 55V (Pb battery), and recently 20HP at 85V (LIPO), so for having more power you either need more voltage (which makes the inverter more expensive) or you need a lower voltage motor (then you need more current to get the same torque). Keep in mind that the original nominal voltage is 115 VAC, and it changes to 67 VAC when changing to triangle, then from 67 to 85 V you can get some extra power. So, it means, your efficiency could be even higher in appropriate star configuration, eliminating parasitic recirculating current of delta, right? Do you plan to keep delta? Well, I designed a circuit board which linearly increases the frequency of the inverter which in turn relates to frequency of the motor. The ramping up of the frequency in a linear manner causes the motor to follow the "Family of Torque Speed Curves", in which the peak torque is maintained to certain extent. After that if the motor doesn't have enough supporting voltage, the rotor will fall out of synchronism. Yeah, I understand that 24V battery is very low, but I am restricted to this, since it is intended to go on a airplane where it is supposed to operate no greater than 24V DC. I need to dig more into what you suggested, the vector control method and also have to do some research on Dynamometers. By the way I came to know that one of my friends has an AW DynoPro 2100S, but he didnt used it for the past ten years. So have to get a manual for it and should get acquaint with how to use it. Is there something called torque meter which sits or attaches to the rotor shaft to give instantaneous torque values? e-vektor - Did you take any AC current measurements for the dyno run that you posted? 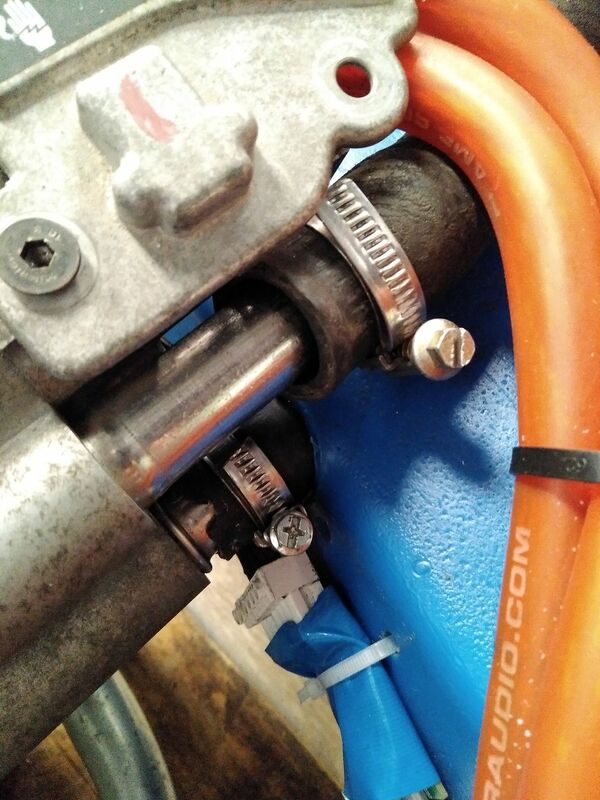 ChazFisher wrote: e-vektor - Did you take any AC current measurements for the dyno run that you posted? no, but they are suposed to be controlled by the Curtis and limited to 550A (triangle), which is equivalent to 323A in star. Indeed the Curtis controller can do a log at 100 ms rate, but current is flat. Also stator frequency can be seen in this log. What's the latest on this motor hack attempt. Were you able to get the motor up and running? I'd be interested in the potential overheating issues with the high power levels you were reaching. Great work, by the way! electro wrks wrote: What's the latest on this motor hack attempt. Were you able to get the motor up and running? I'd be interested in the potential overheating issues with the high power levels you were reaching. Great work, by the way! Of course with the +50% current usage the efficiency decreases (up to 65% in worst case) and heat increases. 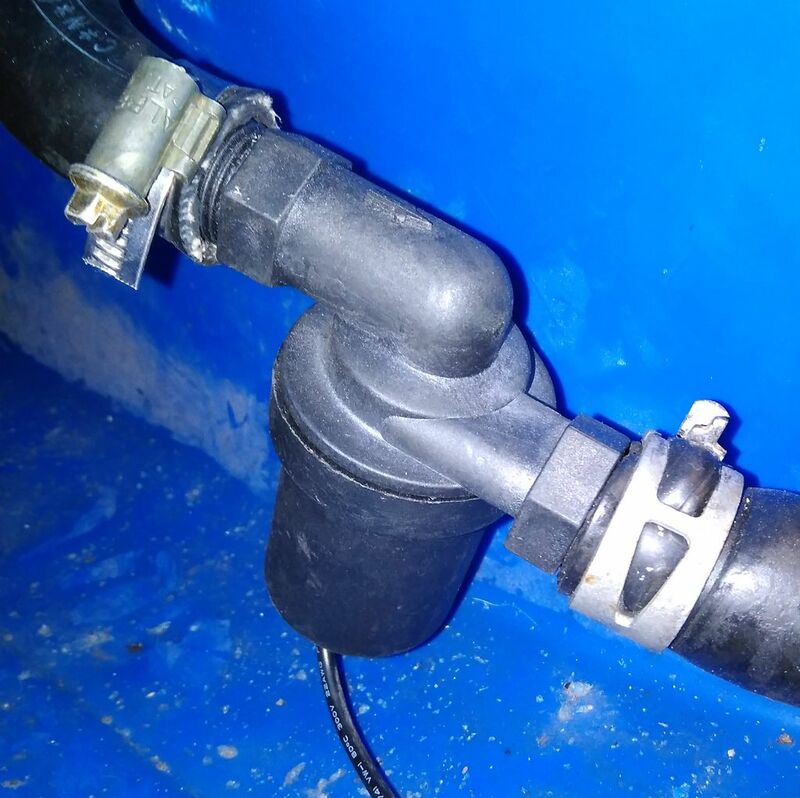 Radiator and water pump are mandatory, but the good news is that the kart is not working all the time at full throttle, indeed the rider told me that he cannot deliver full throttle in any corner, only the straight part. Last edited by e-vektor on Aug 15 2018 5:02pm, edited 1 time in total. OK, thanks. 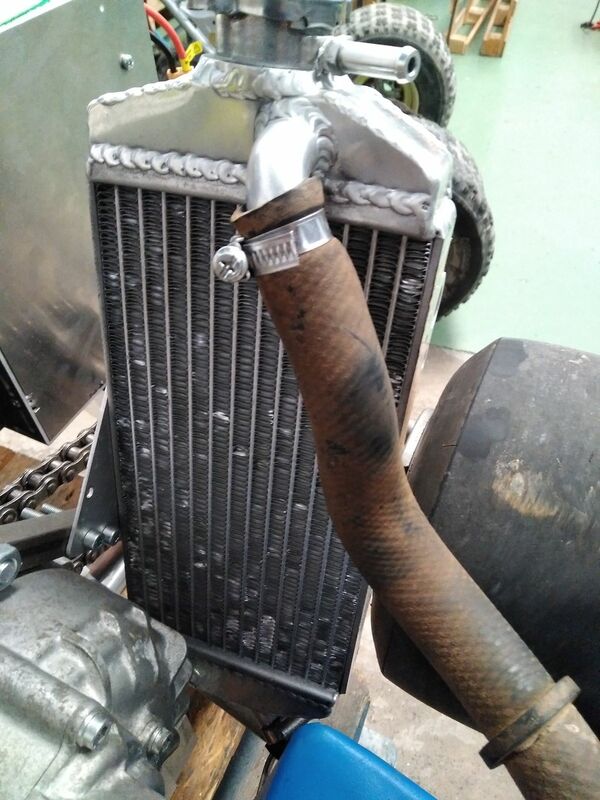 I've been trying to find a hybrid car power stage to recycle, in keeping with the theme of re-purposing parts. I'm having trouble finding anything simple that is rated for anywhere near that power level. To get a current rating near the 550A, I have to go to something like a full hybrid car (Chevy Volt, etc.) inverter. Thank you for your response. If you have the cooling system set-up (radiator, hoses, pumps,etc. ), could you post some photos of it so we can get some idea of what would be needed? Also, could you post a simple spread sheet of the controllers(model, voltage, and current rating) you're using ( one's a Curtis12??-???? and the other-?) on the vertical axis. On the horizontal axis, the Delta or Y configuration, the voltage used, ~current range, ~RPM range, power output, and other info that you think might be useful. I know most of this info is in your posts and graphs, but it would be very useful to have it laid out in this form. Thank you, Great stuff! Is the 4000rpm limit because of the 300Hz stator frequency limit of the controllers? In higher voltage applications, assuming iron losses are not too big a factor, this could be a problem with this 8 pole motor. Does anyone know if other controllers have higher stator frequency limits? electro wrks wrote: Thank you, Great stuff! Is the 4000rpm limit because of the 300Hz stator frequency limit of the controllers? In higher voltage applications, assuming iron losses are not too big a factor, this could be a problem with this 8 pole motor. Does anyone know if other controllers have higher stator frequency limits? yes, 300 Hz is a big limit for this motor, but also in the WYE configuration it has the base freq. at 1000 RPM, and in the Delta config at about 2200 RPM, so even if you increase the stator freq it will still have very low torque. I would think the iron losses and loss of efficiency would be unacceptably high at those high of voltages. I saw somewhere a Sevcon Gen 4 G9930 controller rated at 300A peak, 120A continuous, 150V max, 500Hz max stator frequency. By my calcs., this potentially could give a max 7,500RPM. In the motor's original application, with an ICE, it looks like it turns a max of 8,000 to 10,000RPM( around 2X crankshaft RPM). So, it should be able to safely handle the 7500RPM. Has anybody tried this controller with this motor? I know the Sevcons have a reputation of being difficult and expensive to set-up. I couldn't start the Sevcon controller yet, but everybody I talked about this, recommended only Curtis for induction motors. Did the people you talked to say why you should use the Curtis, and not the Sevcon? Now I am starting to prepare the setup to evaluate the Motenergy ME1304 motor. Some people state that is should be able to provide up to 60 HP, but I don't think it will be so much. I prepared a new fixture for the dyno and I did a preliminary test with the VESC controller, although surprisingly if blew up at 45V (it was suposed to be ready up to 60V), so finally I had to record the first video with a small ESC, which was almost not able to move the motor. Last edited by e-vektor on Jan 08 2018 3:02pm, edited 1 time in total. Cool. What's that thing you're using as a dyno? I haven't seen one like that before. Thanks. I could see the electromagnets and what resembles the brake rotor on a car. At 150hp, that would need to throw off a huge amount of heat. Just like brakes in a car I guess. That's a pretty high end piece of test equipment. yes, this one was refurbished, and the axles were addeded afterwards (in the truck it uses the transmission, but in the dyno it needs two axles). But it is much work, for new designs I prefer to use new retarders which come with the axle.